We’re almost there: at long last, after one of the frankly just-plain weirdest years of news most of us can remember, Election Day is finally drawing nigh nationwide. And while the candidates at the top of the ticket have definitely captured most of the metaphorical air in the national room, there’s far more than just that at stake this year for most voters. In addition to selecting candidates for dozens of federal, state, and local offices, voters have a wide array of state and local ballot initiatives to choose from this year. Many of those directly address major consumer issues of many kinds. So we’re helping you break those down, with a state-by-state guide. Right up top, let us mention: this guide is not fully comprehensive. Many states have state-level constitutional amendments or other state-level questions and initiatives not related to consumer issues on their ballots, which we do not include. This is not a full breakdown of every ballot, and county, municipal, or other local-level issues may appear on your ballot too. Likewise, Consumerist does not intervene in any political campaign, either on behalf of or in opposition to, any candidate for public office. We’re not talking about the people you could vote in or out. We strongly encourage you to use your state Board of Elections or Secretary of State website — or a site like Ballotpedia — to look up your full, local-level sample ballot before you vote. Wherever possible, we have linked directly to the official tools or instructions each state provides for doing that. What Google retrieves may not be as comprehensive as official government-provided tools, but it’s better than nothing. So, with all that said, after casting a high-level eye over the U.S., what are we seeing? The hottest question this year is most definitely the topic of who can toke. Initiatives to decriminalize, regulate, tax, or legalize either medical or recreational marijuana use are popping up all over. State-wide initiatives related to marijuana appear on the ballot this year in nine states: Arizona, Arkansas, California, Florida, Maine, Massachusetts, Montana, Nevada, and North Dakota. Also a pressing issue for 2016? Minimum wage increases. Four states — Arizona, Colorado, Maine, and Washington — have ballot measures this year seeking to raise the minimum wage in the state to $12 or higher. Other consumer topics we’re seeing addressed at the state level this year include energy/utility regulation (Florida and Nevada), predatory lending (South Dakota), shopping bags (California), and animal (livestock) welfare (Massachusetts). Want to know what’s on tap in your home turf this year? We’ve had a look at all 50 states and D.C., so scroll on down. None of the state-level questions or referenda on the Alabama ballot pertain to consumer issues. Alabama residents can use the county-level links on the AL Secretary of State site to look up full local ballots for 2016. None of the state-level questions on the Alaska ballot pertain to consumer issues. Alaska residents can view their sample ballot, sorted by House District, on the AK state government site. Arizona has two initiatives on the statewide ballot. Both are consumer-issues items. Proposition 205 proposes to legalize the recreational use and ownership of marijuana by adults ages 21 and over, and to create a regulatory body and a taxation scheme for marijuana sales and use. A YES vote supports enacting the law, which would permit sales beginning March 1, 2018. A NO vote does nothing and maintains the status quo. Proposition 206 proposes raising the minimum wage gradually to $12 by the year 2020 (starting on Jan. 1, 2017), and also guarantees all workers in the state a right to a certain amount of paid sick leave per year. A YES vote supports enacting the law. A NO vote does nothing and maintains the status quo. Arizona residents can view state voter information on the AZ Secretary of State site or search for [county name] Arizona sample ballot online for local information. Issue 6 proposes to amend the state constitution to legalize medical use of marijuana for 17 specific health conditions, create a state commission, and set up a taxation scheme for it. A YES vote supports the amendment and makes it effective as of November 9 (with each provision having between 45 and 180 days to become effective thereafter). A NO vote does nothing and maintains the status quo. Issue 7 also proposes to legalize the medical use of marijuana, but without amending the state constitution. The statute that would be enacted by Issue 7 would legalize medical marijuana as a treatment for 56 health conditions, would make it regulated by the Department of Health, and would set up a different taxation scheme for it than Issue 6 would. A YES vote supports the law. A NO vote does nothing and maintains the status quo. Arkansas residents can use this tool to look up their full local ballot for 2016. Proposition 64 seeks to legalize the use of recreational marijuana for adults ages 21 and over, and to establish a regulatory body, licensing criteria, and taxation scheme for cultivation and sales. A YES vote supports the law, most provisions of which would start on January 1, 2018. A NO vote changes nothing and maintains the status quo. Proposition 67 is a veto referendum determining whether an existing state law on the books, pertaining to mandatory fees for the use of plastic shopping bags, can go into effect. A YES vote keeps the law in place and supports enacting it. A NO vote supports overturning the law. California also has a second bag-related question on the ballot this year, Proposition 65, which proposes redirecting the revenue generated by bag taxes to a special fund. California residents receive sample ballots by mail, or can view most county-level sample ballots online. Amendment 70 proposes to amend the state constitution in order to raise the minimum wage gradually to $12 by 2020. A YES vote adopts the amendment, to become effective within 30 days of the election. A NO vote rejects it, and maintains the status quo. Colorado residents can view state voter information on the CO state government site or search for [county name] Colorado sample ballot online for local information. There are no state-level consumer-issues questions or referenda on the Connecticut ballot. Connecticut residents can visit the CT Secretary of State site to view town-level full local ballots for 2016. There are no state-level consumer-issues questions or referenda on the Delaware ballot. Delaware residents can use this tool to look up their full local ballot for 2016. None of the not-quite-a-state-level questions or referenda on the D.C. ballot pertain to consumer issues. District of Columbia residents can view sample ballots for all wards in this document (PDF). Amendment 1 pertains to the use and subsidization of solar energy. A YES vote supports adding language to the state constitution banning state or local laws that subsidize home solar energy use. A NO vote changes nothing and maintains the status quo. Consumers Union, the policy and mobilization arm of Consumerist’s parent company, Consumer Reports, opposes Amendment 1, arguing that it is funded by large utility companies, is misleading, and would create significant barriers to home solar adoption. Amendment 2 proposes expanding the state’s medical marijuana laws to explicitly allow doctors to prescribe marijuana as a treatment for patients suffering from a broader range of illnesses and conditions than currently. A YES vote supports adding the language to the state constitution. A NO vote changes nothing and supports the status quo. Florida residents can use the county-level links on the FL Secretary of State site to look up full local ballots for 2016. None of the state-level questions or referenda on the Georgia ballot pertain to consumer issues. Georgia residents can use this tool to look up their full local ballot for 2016. None of the state-level questions or referenda on the Hawaii ballot pertain to consumer issues. 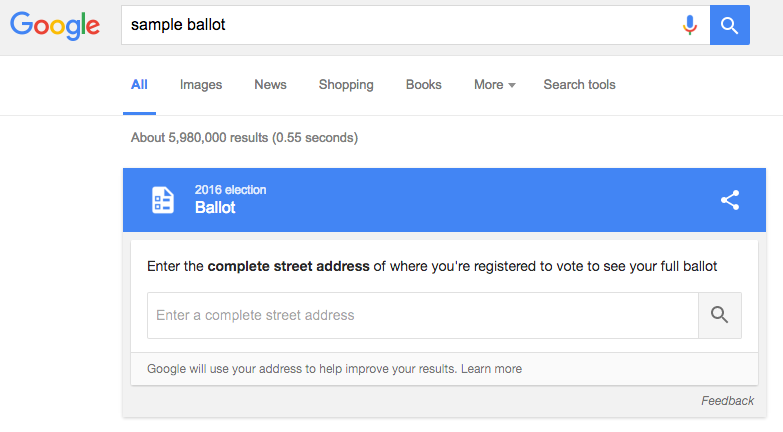 Hawaii residents can use this tool to look up their full local ballot for 2016. None of the state-level questions or referenda on the Idaho ballot pertain to consumer issues. Idaho residents can view state voter information on the ID Secretary of State website, or search for [county name] Idaho sample ballot online for local information. None of the state-level questions or referenda on the Illinois ballot pertain to consumer issues. Illinois residents can view state voter information on the state’s Board of Elections website, or search for [county name] Illinois sample ballot online for local information. Voters registered in Chicago can also visit the city’s Board of Elections site. None of the state-level questions or referenda on the Indiana ballot pertain to consumer issues. Indiana residents can use this tool to look up their full local ballot for 2016. There are no state-level consumer-issues questions or referenda on the Iowa ballot. Iowa residents can view state voter information on the IA Secretary of State website, or search for [county name] Iowa sample ballot online for local information. None of the state-level questions or referenda on the Kansas ballot pertain to consumer issues. Kansas residents can view state voter information on the KS Secretary of State website, or search for [county name] Kansas sample ballot online for local information. There are no state-level consumer-issues questions or referenda on the Kentucky ballot. Kentucky residents can use the KY Secretary of State site to look up full local ballots for 2016. None of the state-level questions or referenda on the Louisiana ballot pertain to consumer issues. Louisiana residents can use these tools on the LA Secretary of State site to retrieve their full local ballot for 2016. Question 1 proposes to legalize recreational marijuana use and ownership up to 2 1/2 oz for residents ages 21 and up, and would create a regulatory and taxation scheme under which recreational marijuana could be sold and used in the state. A YES vote supports enacting the proposed law 30 days after the election. A NO vote does nothing and maintains the status quo. Question 4 proposes to raise the state minimum wage gradually to $12 by 2020, including increases in the minimum wage for workers who receive tips, bringing tipped and non-tipped workers to wage parity eventually. A YES vote supports enacting the proposed law 30 days after the election. A NO vote does nothing and maintains the status quo. Maine residents can use this tool to look up their full local ballot for 2016. None of the state-level questions or referenda on the Maryland ballot pertain to consumer issues. Maryland residents can use this tool to look up their full local ballot for 2016. Question 3 proposes to prohibit raising certain farm livestock from being held or raised in tightly confined spaces. A YES vote approves of the measure and kicks it to the legislature. A NO vote does nothing and maintains the status quo. Question 4 proposes to legalize recreational use and ownership of marijuana in certain amounts (1 oz in public, 10 oz at home) and to create a commission to tax and regulate it similarly to state regulation of alcohol. A YES vote supports the proposal, which would, if enacted, take effect in December. A NO vote opposes it, and maintains the status quo. Massachusetts residents can use this tool to look up their full local ballot for 2016. There are no state-level consumer-issues questions or referenda on the Michigan ballot. Michigan residents can use this tool to look up their full local ballot for 2016. None of the state-level questions or referenda on the Minnesota ballot pertain to consumer issues. Minnesota residents can use this tool to look up their full local ballot for 2016. There are no state-level consumer-issues questions or referenda on the Mississippi ballot. Mississippi residents can view their sample ballot for 2016 on the MS Secretary of State site. None of the state-level questions or referenda on the Missouri ballot directly pertain to consumer issues. Indirectly, however, the Missouri ballot has several measures on it related to sales and use taxes. Amendment 3, which seeks to increase the cigarette tax by $0.60, and Proposition A, which seeks to increase the cigarette tax by $0.23, are in direct conflict. The Missouri attorney general believes that, if both pass, the court will sort it out. Missouri residents can use this tool to look up their full local ballot for 2016. Initiative 182, the Montana Medical Marijuana Initiative, proposes to repeal the existing three-patient limit on medical marijuana providers in the state and would permit more physicians to prescribe marijuana to more patients. A YES vote refers the issue to the state legislature to take up and create law on. A NO vote does nothing and maintains the status quo. Montana residents can use this tool to look up their full local ballot for 2016. None of the state-level questions or referenda on the Nebraska ballot pertain to consumer issues. Nebraska residents can retrieve their full 2016 sample ballots on the NE Secretary of State site. Question 2 would legalize the recreational use of marijuana in the amount of one ounce or less, for adults ages 21 and over. A YES vote sends the proposal to the state legislature to consider making law. A NO vote does nothing and maintains the status quo. Question 3 would deregulate the Nevada electric utility market through an amendment to the state constitution. A YES vote approves of the measure and would force it to appear again on the 2018 ballot before becoming approved. A NO vote does nothing and maintains the status quo. Nevada residents can use this tool to look up their full local ballot for 2016. There are no state-level consumer-issues questions or referenda on the New Hampshire ballot. New Hampshire residents can use the NH Secretary of State site to look up their full local ballot for 2016 by town. None of the state-level questions or referenda on the New Jersey ballot pertain to consumer issues. New Jersey residents can view the full voters’ guide to their ballots on the NJ Secretary of State website, search for [county name] New Jersey sample ballot online for local information. None of the state-level questions or referenda on the New Mexico ballot pertain to consumer issues. New Mexico residents can use this tool to look up their full local ballot for 2016. There are no state-level consumer-issues questions or referenda on the New York ballot. New York residents can view state voter information on the state’s Board of Elections website, or search for [county name] New York sample ballot online for local information. Voters registered in the five boroughs of New York City can also visit the city’s Board of Elections site. There are no state-level consumer-issues questions or referenda on the North Carolina ballot. North Carolina residents can use the state board of elections site to look up their full local ballot for 2016; there are instructions here for the necessary steps. Initiated Statutory Measure No. 5 would legalize strictly regulated medicinal use of marijuana. Qualified patients could purchase amounts up to 3 oz or, if living more than 40 miles from the nearest registered dispensary, grow small amounts legally at home. A YES vote approves the law; a NO vote rejects it and maintains the status quo. North Dakota residents can view state voting information on the ND Secretary of State site or search for [county name] North Dakota sample ballot online for local information. There are no state-level consumer-issues questions or referenda on the Ohio ballot. Ohio residents can use this tool to look up their full local ballot for 2016. State Question 779 proposes to amend the state Constitution in order to raise the state sales and use tax by 1% to fund education in a specific way. A YES vote approves of the proposal and adds the language; a NO vote maintains the status quo. State Question 792 proposes to repeal a section of the state Constitution pertaining to alcohol sales and to restructure alcohol sales laws so that beer and wine can be sold in grocery stories and to revamp alcohol licenses in the state. A YES vote approves of the proposal; a NO vote maintains the status quo. Oklahoma residents can use this tool to look up their full local ballot for 2016. None of the state-level questions or referenda on the Oregon ballot pertain to consumer issues, although at least four counties do have measures pertaining to marijuana sales and/or taxation on theirs. Oregon residents can view the full voters’ guide to their ballots on the OR Secretary of State website. None of the state-level questions or referenda on the Pennsylvania ballot pertain to consumer issues. Pennsylvania residents can view state voter information on the state’s voter resource center website, or search for [county name] Pennsylvania sample ballot online for local information. None of the state-level questions or referenda on the Rhode Island ballot pertain to consumer issues. Rhode Island residents can use this tool to look up their full local ballot for 2016. There are no state-level consumer-issues questions or referenda on the South Carolina ballot. South Carolina residents can use this tool to look up their full local ballot for 2016. Initiated Measure 21 proposes to prohibit state-licensed payday, title, and other short-term loan lenders from imposing interest rates greater than 36%. A YES vote enacts the law and imposes penalties; a NO vote maintains the status quo. Additionally, proposed state Constitutional Amendment U also seeks to restrict the interest rates on all lending to 18% if no written agreement exists. Where a written agreement does exist, the amendment would not restrict the terms. A YES vote changes the language in the state constitution; a NO vote maintains the status quo. South Dakota residents can use this tool to look up their full local ballot for 2016. There are no state-level consumer-issues questions or referenda on the Tennessee ballot. Tennessee residents can use this tool (also in app form) to look up their local ballot for 2016. There are no state-level consumer-issues questions or referenda on the Texas ballot. Texas residents can visit the TX Secretary of State elections website to look up their ballot for 2016. There are no state-level consumer-issues questions or referenda on the Utah ballot. Utah residents can use this tool to look up their full local ballot for 2016. There are no state-level consumer-issues questions or referenda on the Vermont ballot. Vermont residents can use this tool to look up their full local ballot for 2016. None of the state-level questions on the Virginia ballot pertain to consumer issues. Virginia residents can use this tool to look up their full city or county ballot for 2016. Initiative Measure No. 1433 proposes to increase the state minimum wage gradually to $13.50 by 2020. A YES vote enacts the law and increases minimum wage; a NO vote maintains the status quo. Initiative Measure No. 1501 proposes to increase the penalties for identity theft and consumer fraud targeted at seniors or vulnerable individuals. A YES vote enacts the law and increases the penalties; a NO vote maintains the status quo. Washington residents can look up their full local ballot information for 2016 on this site. There are no state-level consumer issues questions or referenda on the West Virginia ballot. West Virginia residents can visit the WV Secretary of State website to read more about their local ballot for 2016. Wisconsin residents can use this tool to look up their full local ballot for 2016. None of the state-level questions on the Wyoming ballot pertain to consumer issues. Wyoming residents can visit the WY Secretary of State website to read more about their ballot for 2016.
how will everyone know i voted? Next Meijer Ditches Plus-Size Department To Attract More Plus-Size Customers: Wait, What? Next Up: Meijer Ditches Plus-Size Department To Attract More Plus-Size Customers: Wait, What?